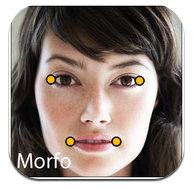 Morfo - All about apps in YOUR classroom! Utilize this engaging app to turn a photo into a 3-D character. Simply capture an image within the app or access your camera roll. Make your character talk using the animation features and the "record" function in Morfo. Export your finished clip as a movie on your camera roll. The export option is fantastic, because clips can be shared as small digital storytelling pieces, or utilized in larger movie projects. The free version of Morfo limits projects to 30 seconds, but this app remains pretty versatile in terms of what you students can do with it in a classroom setting. Social Studies: Have students animate statues/sculptures of historical figures, then record narratives in which the figure explains his or her own significance. Language Arts: Students can animate photos or drawings of literary characters and narrate character motivations, arguments, or points of view. Art: Give students the task of selecting and animating a photo of a famous portrait; students can have the portraits narrate information about the artist(s) who created them and the political or social climates that affected the work. Science: Elementary students can publish informational text about animals, habitats, biomes, etc. using Morfo and copyright free photos of various species. Fill out this form to get quick feedback on how YOUR students can use the iPad to enhance learning!